Analysis: Should UW basketball fans be worried about the Huskies? Washington has dropped two of its last four games including Saturday's 55-47 loss to Oregon. The Huskies stumble into next week's Pac-12 Tournament on the heels of their worst offensive performance of the season. Washington’s response to prosperity is troubling. 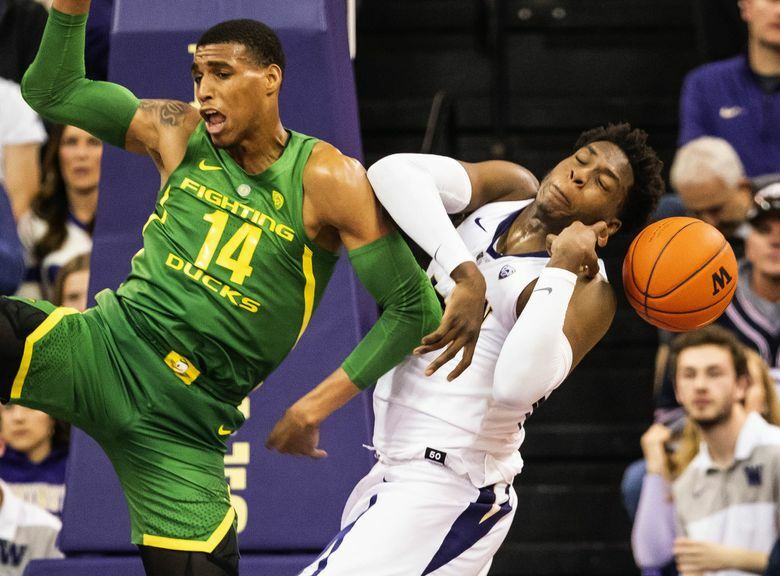 Since winning the Pac-12 regular-season championship two weeks ago, the Huskies have struggled in their past four games, including Saturday night’s 55-47 defeat to Oregon in the regular-season finale at Alaska Airlines Arena. Washington (24-7) finished on top of the Pac-12 at 15-3, which ties the 1943-44, 1952-53 and 1983-84 teams for the most conference wins in school history. Here are three impressions from the game. SHOULD UW FANS BE WORRIED? The old adage says it’s best to head into the postseason riding a wave of momentum and quite frankly, the Huskies can’t be overly excited after scoring a season-low 47 points. Dig a little deeper and you’d spot a troubling trend in the past four games in which three of the contests were decided on the final possession and the combined margin of victory in the wins was six points. And UW lost 76-73 at last-place California last week, which is a game no one will soon forget. Suffice to say, Washington isn’t sprinting into the Pac-12 Tournament, but it’s impossible to know right now if the Huskies have peaked, plateaued or beginning to plummet. Obviously, this team isn’t playing as well as it did during its 12-game winning streak at midseason when UW had eight double-digit victories. Following the loss to Oregon, Noah Dickerson suggested it’s difficult to beat teams twice in a season. (UW won 61-56 at Oregon on Jan. 24). Coach Mike Hopkins swatted away that theory and pointed to more tangible reasons such as the Huskies’ season-low four assists on Saturday. Washington’s offense sputtered and stalled in the first half while tallying just 18 points — a season low. Before the break, the Huskies converted just 5 of 23 field-goal attempts and had eight turnovers. But keep in mind, Oregon is a difficult matchup for Washington. Last year, the Ducks handcuffed the Huskies during a 65-40 defeat. It was the third fewest points for UW since 1952. For a while, it looked as if Washington was heading toward another historic night of offensive futility until Jaylen Nowell got going in the second half and scored 11 of his 17 points. Dickerson also rebounded from a miserable first half and finished with 14 points on 4-for-8 shooting and 16 rebounds. Still, the Huskies couldn’t overcome a dreadful offensive display on the perimeter where they tied a season-low with three three-pointers on 20 attempts. So should UW fans be worried? Heck, yes. Maybe. Not really? NCAA tournament bracket expert Jerry Palm at CBS projects the Huskies as a No. 10 seed in the East region against No. 7 Louisville in Jacksonville, Fla. It would seem Washington has already secured an at-large berth to the Big Dance. “In my opinion, they’ve earned the right to be in that tournament regardless of what happened tonight and or what happens in Las Vegas,” he said. Game 2: No. 5 Colorado (19-11) vs. No. 12 California (8-22), 2:30 p.m.
Game 3: No. 7 UCLA (16-15) vs. No. 10 Stanford (15-15), 6 p.m.
Game 4: No. 6 Oregon (19-12) vs. No. 11 Washington State (11-20), 8:30 p.m.
Game 6: Game 2 winner vs. No. 4 Oregon State (18-12), 2:30 p.m.
Game 7: Game 3 winner vs. No. 2 Arizona State (21-9), 6 p.m.
Game 8: Game 4 winner vs., No. 3 Utah (17-13), 8:30 p.m. (ESPN). Game 9: Semifinal 1, 6 p.m.
Game 10: Semifinal 2, 8:30 p.m. (ESPN). Game 11: Pac-12 Championship, 7:30 p.m. (ESPN). It was an emotional pregame ceremony for UW’s four seniors and their families, which included a video tribute from the team, bouquets of flowers, gifts, tears, hugs and a standing ovation from the sold-out crowd. Dickerson drew laughs when he walked out with his pet dog Sosa. David Crisp fought hard to keep from crying, but tears flowed after he wrapped his arms around Hopkins at midcourt. Dominic Green, who started in place of sophomore Hameir Wright, played to the crowd during introductions while flashing his trademark three-point sign before bending over to kiss the big purple “W” on the midcourt floor. And Matisse Thybulle and his family wore T-shirts with a picture of his mother Elizabeth who passed away in 2015 after a battle with acute myeloid leukemia. The Huskies also honored Dejounte Murray, who sat courtside, with a framed No. 5 jersey. Murray was a member of the 2015 recruiting class who played one year at UW before going to the NBA. Lost in the commotion was Nowell and the prospects of whether Saturday night was the final home game for the sophomore star. Nowell is projected as the fifth pick in the second round — No. 35 overall — in the NBA draft, according to NBAdraft.net. Pac-12 Networks analyst Don MacLean floated a theory Saturday that Oregon State star Tres Tinkle could steal the Pac-12 player of the year award away from Thybulle or Nowell. It’s an idea that could gain traction among conference coaches who submit their ballots on Sunday. The postseason awards will be announced 5 p.m. Monday on the Pac-12 Networks. Tinkle is the only Division I player averaging at least 20 points, 8.0 rebounds and 4.0 assists. And he’s the only player in the Pac-12 in the top 10 in the league in scoring (second, 20.5), rebounding (fifth, 8.0), assists (eighth, 4.0) and steals (fourth, 1.6). Thybulle’s player of the year candidacy is buoyed by a record-breaking defensive performance. On Saturday, he tied former California star Jason Kidd for the Pac-12 single-season steals mark of 110. Thybulle is also the only Division I player since 1992-93 with at least 100 steals and 60 blocks. And Nowell is simply the best offensive player on the Pac-12’s best team.